What a great idea! My wife still talks about the day I showed up in a stretch limo to take her and our new daughter home. It's been well worth every penny I spent! Diamond Limousines Has the X FACTOR! Diamond Limos, the number one North East limo hire company, recently had the pleasure of driving X Factor finalists Bad Lashes and Desire! Bad Lashes are featured alongside our Razor Limousine and Desire opted for the Phantom. View the Client Gallery page for more pictures and testimonials from satisfied Diamond Limousines customers and Celebrities! 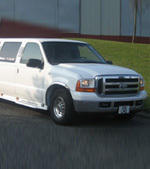 Diamond Limos is the North East's leading Limo Truck Hire company. Our Limo Trucks are the Biggest, Wildest, Longest Limo Trucks in the North East - nobody else can compare! Diamond Limos: The Undisputed Number 1 Limo Company in the North East! At Diamond Limos, we are striving to stay the number one limo company for the people of the North East. Our exceptional service cannot be matched by any other Limo Hire company. If you have used our services or hired any of our cars and enjoyed the experience, we would be delighted if you could tell others about us. On the other hand, if you have any questions or comments regarding Diamond Limos, please Tell Us. We are always excited to hear from our customers, and we implement many of the ideas that are sent to us. Diamond-Limos is a well established family run company we pride ourselves in giving first class chauffeur driven limousines/car hire and wedding cars covering the North East. Diamond Limo's is the North East's leading Limousine and chauffeur car service. We cover the widest area at the best prices. Whether you need a limousine for that important meeting, a friends birthday or a school prom, Diamond Limo's guarantee customer satisfaction. To apply for a position within Diamond Limos, please fill out our Limo Driver Application Form - Please note, applicants must have a PSV or PCV license. Hire one of diamond-limos chauffeur driven luxury limousines or wedding cars and travel in style. It could be for a hen night, stag night, birthday or any other special occasion. You will be arriving in style with one of our fabulous limousines. If it's a wedding car you want then look no further, we have a wide range of luxury wedding cars and vintage cars to choose from covering the North East, Sunderland, Durham, Hartlepool Tyne & Wear Cleveland Newcastle and throughout the region. Limousine hire in the North East has never been easier! Fill in our contact form with details of your event or special occasion and we'll get back to you with prices and availbility. Diamond Limos has a number of Wedding Cars available for hire throughout the North East. Our Wedding Car Fleet includes Chrysler, Daimler, Rolly Royce, Beauford and many more. Diamond Limos havean amaing Baby Bentley wedding car for hire! The Baby Bentley. Please call to check availablility. We also cover these areas in the north east Newcastle airport Leeds airport Teesside airport Durham Sunderland Middlesbrough Coxhoe Newton Aycliffe Consett Washington Gateshead Darlington Bowburn Billingham West Auckland if you don't see your area then give us a call and we may be able to help. Whether you want a pink limousine or the diamond jeep or even the silver glitter jeep limo the black diamond limousine I'm sure you'll be thrilled with whatever you choose and don't forget the mystery machine for the little ones...we cover most areas of the northeast just pick up the phone today and don't delay. Northeast Limousine hire and wedding cars Sunderland limo hire Durham limousine hire Peterlee limo hire Washington limo hire Hartlepool limo hire Stockton limo hire Consett limousine hire Bishop Auckland limo hire Spennymoor limo hire Gateshead limo hire Teesside limo hire Cleveland limo hire Chester-le-Street limousine fire covering the North East of England. We cover the following areas in the North East for Wedding Cars and Limousine Hire - Acomb, Allendale, Allenheads, Alnmouth, Alnwick, Amble, Annfield Plain, Ashington, Bamburgh, Barnard Castle, Barrasford, Beadnell, Beamish, Bedlington, Belford, Bellingham, Belsay, Berwick-upon-Tweed, Billingham, Birtley, Bishop Auckland, Bishop Middleham, Blackhall, Blaydon, Blyth, Boulmer, Bowburn, Bowes, Brancepeth, Brandon, Burnopfield, Castle Eden, Castleside, Chester-le-Street, Chillingham, Chilton, Cleadon, Consett, Corbridge, Coxhoe, Cramlington, Craster, Crook, Cullercoats, Dipton, Durham City, Eaglescliffe, Easington, Ebchester, Eglingham, Embleton, Esh Winning, Eshott, Ferryhill, Fishburn, Frosterley, Gainford, Great Lumley, Greenhead, Guisborough, Haltwhistle, Harbottle, Haswell, Haydon Bridge, Hebburn, Heddon on the Wall, Heighington, Hetton-Le-Hole, Hexham, Horden, Houghton-Le-Spring, Hurworth-on-Tees, Ingleby Barwick, Jarrow, Kielder, Kirkwhelpington, Lanchester, Langley Park, Lindisfarne, Marske-by-the-Sea, Middleton in Teesdale, Middleton St George, Morpeth, Murton, Newbiggin-by-the-Sea, Newton Aycliffe, Otterburn, Penshaw, Peterlee, Pity Me, Ponteland, Prudhoe, Redcar, Rothbury, Rowlands Gill, Ryton, Sacriston, Sadberge, Saltburn, Seaham, Seahouses, Seaton Delaval, Sedgefield Shildon, Shotton, Skelton, Slaley, South Shields, Spennymoor, Staindrop, Stamfordham, Stanhope, Stanley, Stocksfield, Swarland, Tanfield Lea, Teesdale, Thornaby, Thornley, Tow Law, Trimdon, Tudhoe, Tynemouth, Ushaw Moor, Wallsend, Warkworth, Washington, West Auckland, West Rainton, Whickham, Whitburn, Whittingham, Willington, Wingate, Wolsingham, Wooler, Wylam, Yarm.